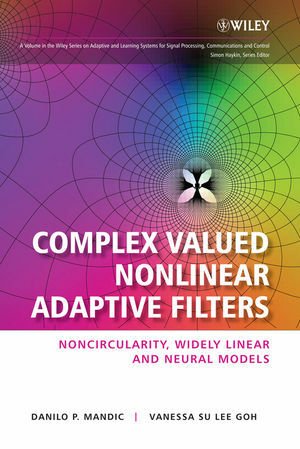 This book was written in response to the growing demand for a text that provides a unified treatment of linear and nonlinear complex valued adaptive filters, and methods for the processing of general complex signals (circular and noncircular). It brings together adaptive filtering algorithms for feedforward (transversal) and feedback architectures and the recent developments in the statistics of complex variable, under the powerful frameworks of CR (Wirtinger) calculus and augmented complex statistics. This offers a number of theoretical performance gains, which is illustrated on both stochastic gradient algorithms, such as the augmented complex least mean square (ACLMS), and those based on Kalman filters. This work is supported by a number of simulations using synthetic and real world data, including the noncircular and intermittent radar and wind signals. Dr Mandic is currently a Reader in Signal Processing at Imperial College, London. He is an experienced author, having written the book Recurrent Neural Networks for Prediction: Learning Algorithms, Architectures and Stability (Wiley, 2001), and more than 150 published journal and conference papers on signal and image processing. His research interests include nonlinear adaptive signal processing, multimodal signal processing and nonlinear dynamics, and he is an Associate Editor for the journals IEEE Transactions on Circuits and Systems and the International Journal of Mathematical Modelling and Algorithms. Dr Mandic is also on the IEEE Technical Committee on Machine Learning for Signal Processing, and he has produced award winning papers and products resulting from his collaboration with industry. Dr Goh is currently working as a Reservoir Imaging Geophysicist at Shell in Holland. Her research interests include nonlinear signal processing, adaptive filters, complex-valued analysis, and imaging and forecasting. She received her PhD in nonlinear adaptive signal processing from Imperial College, London and is a member of the IEEE and the Society of Exploration Geophysicists.